When Cthulhu rises, we're all doomed... but whose downfall will be the most entertaining? 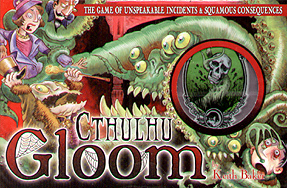 In Cthulhu Gloom you control the fate of your Lovecraftian protagonists, guiding them down a path of horror and madness to an untimely death. Meanwhile, you'll play positive cards on your opponents to keep them happy, healthy, and annoyingly alive. The transparent cards reveal or obscure the effects of cards below, and the totals showing through determine your score. When one group finally falls prey to the interdimensional doom that awaits us all, whoever has suffered the most terrifying tale wins! Players take on the role of a family whom they have to make miserable and then kill them off for points based on how miserable they end up. Other players will try to cheer your family up or hinder you with various cards. Like Gloom the cards are see-through with icons placed strategically on each one to cover over elements of the card underneath. This is a genius bit of design that works exceptionally well, the artwork on the cards is superb and suits it's theme brilliantly. This is a really entertaining game to play and the cthulhu version takes all the best elements of the original as well as adding in new tweaks to enhance the game further. Really enjoy this one and should definitely get it to the table more often.